Ayurvedic Medicine (For External Use Only). Organically Pure & Preservative Free Dermatologist Tested For Safety. Ophthalmologist Tested. No Animal Testing. This is Not a Cosmetic Product. It has Therapeutic Properties. SEAWEED is drenched with lipids, proteins, vitamins, minerals and other nutritive elements from the sea. 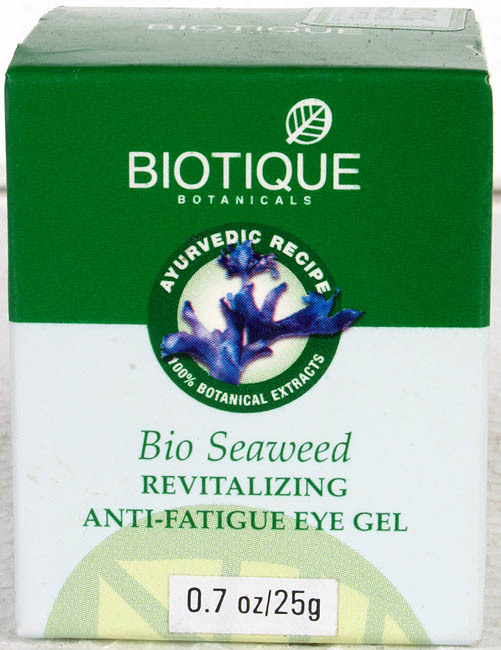 This refreshing eye gel reduces and prevents signs of stress, puffiness and dark circles. TO USE: Lightly pat around eye area, morning and evening. CONTAINS: Chlnai Ghas (Gelidium cartilagineum) 1.0%, Punarnava (Boerhavia diffusa) 3.0%, Bahera (Terminalia belerica) 3.5%, Badam (Prunus amygdalus) 1.5%, Jaiphal (Myristica fragrans) 0.5%, Madhu (Honey (Mel) 2.0%, Kheera (Cucumis sativus) 1.0%, Himalayan Water Q.S.